Tieto Product Development Services (PDS) is world leader in high expertise product development services and niche products for Wireless and Cloud. 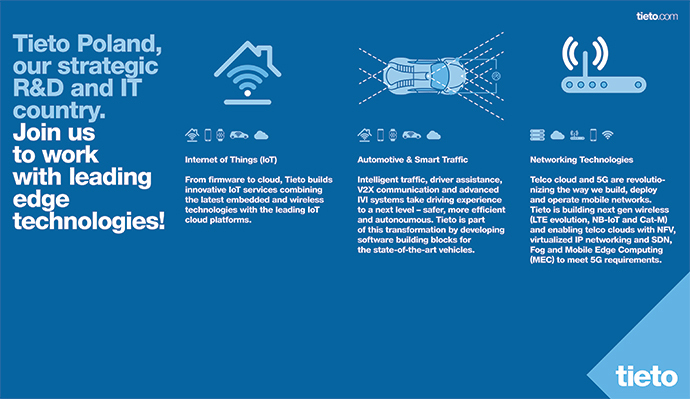 Our focus is on Networking, Internet of Things and Smart Traffic. We’re a key partner to our customers, helping them bring fantastic and innovative products to market with success. We are a team with world class expertise and passion, transforming next generation networks and connected device platforms, helping customers in the development of Cloud/Network Function Virtualization, 5G and IoT Technology. Cooperating with multi-site international network of experts working on modern telecommunication systems for world market radio telecom vendors. Development of mobile telecommunication technologies – mainly Radio Access (LTE). good English, both written and spoken. For some 5G is the future, for us at Tieto is another day at work. Join us at the edge of technology.